Today I want to show you the first large size scarf in this series. Cent Plis de Miao (One hundred pleats of Miao – a province in China) was designed by Aline Honoré and first released in 2010. Cent Plis de Miao depicts a skirt traditionally worn by tribeswomen from the Miao culture. Almost four million people of the Miao live in China (there are also tribes in Vietnam and Laos, where they’re called “Hmong”). The name Miao means “raw rice”. The skirt in the scarf design is often mentioned in songs and folk tales and is an important element of the culture. The fabrics are pleated, a technique believed to be inspired by mushroom gills. The finer the pleats, the higher the value of the dress. One of the most prolific designers in the service of Hermès, Aline Honoré has created an inspired design, depicting the skirt in all its splendour. Spread across the background is another type of fabric design that the Miao women wear tied around their legs, whose patterns are squares and lines. The cashmere/silk shawl (also called CSGM, which stands for cashemire soie grand modèle) is 140×140 cm and is therefore a very large format, a scarf large enough to wear as a dress should you so desire. It is wonderful to cozy up in winter, but also makes a fantastic wrap to carry along on summer nights for when the temperatures drop and the wind gets chilly. I get wear out of my CSGM’s year-round. I liked this design so much that when the opportunity arose to buy a silk version of the same motif from a friend, I took it. In the smaller (90×90) silk version, the skirt and its pleats seem more delicate, also the lighter pale grey, taupe and turquoise colour scheme give the scarf a very different vibe. This one is more elegant, refined and subtle that its more earthy big sister. In this detail you can see the designer’s signature. 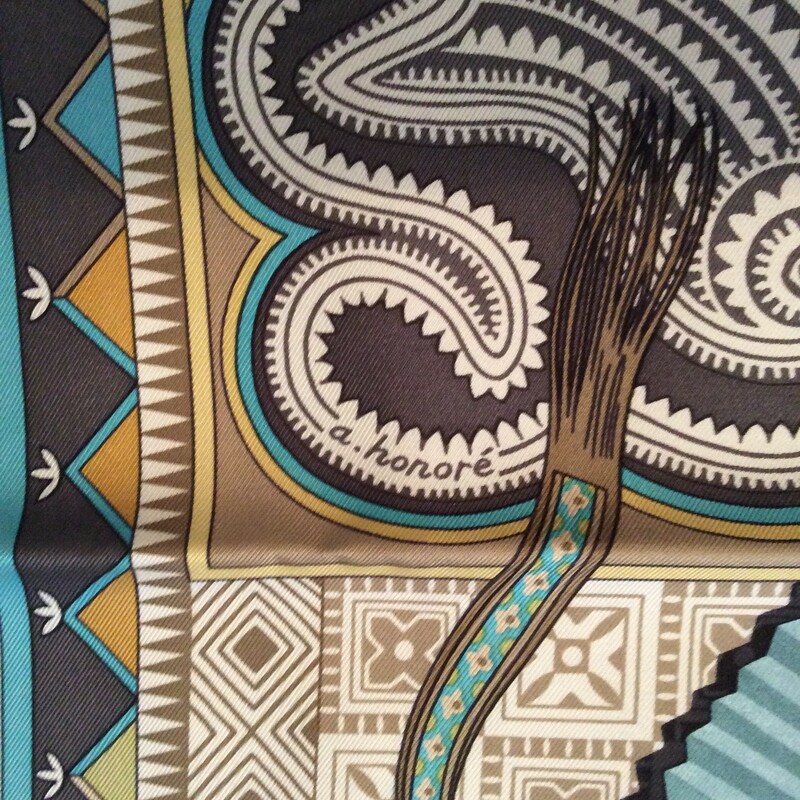 Many, although not all, Hermès scarfs bear a signature somewhere, often well-hidden within the design. I think Mille Plis would have been a more approprate title, since the pleats are so plentiful. 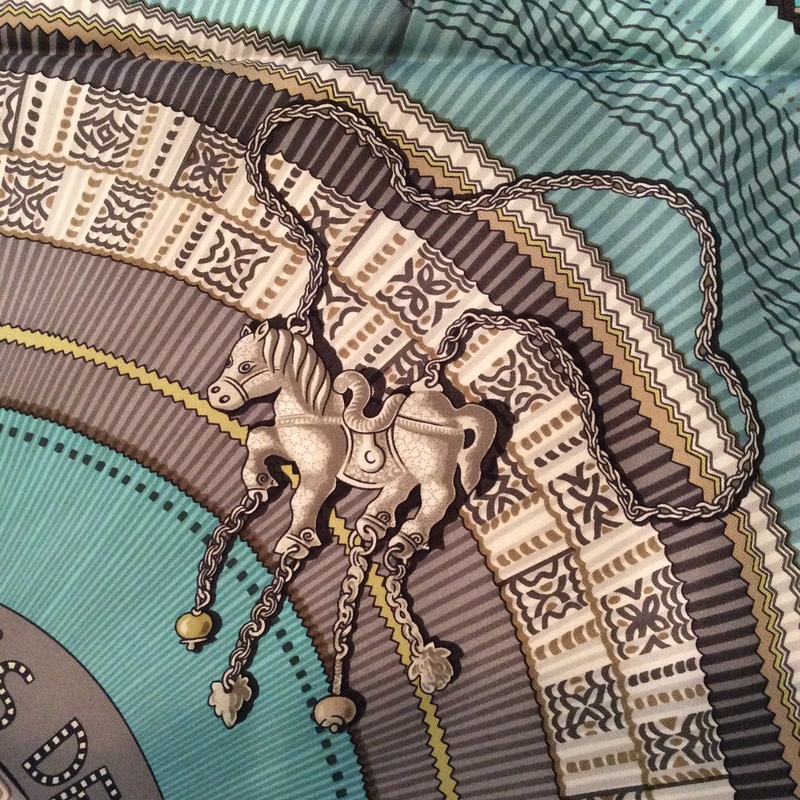 I adore the little horse charm detail lying on the pleats of the skirt, I think it might be a bracelet or a necklace? Here is one more shot of the pleats, the silk screening is so well done and so convincing that the illusion of pleating is very strong here. Next week I will interrupt the collection posts to try and put together a post about identifying an authentic Hermès scarf. Thank you for reading! Have a great weekend! 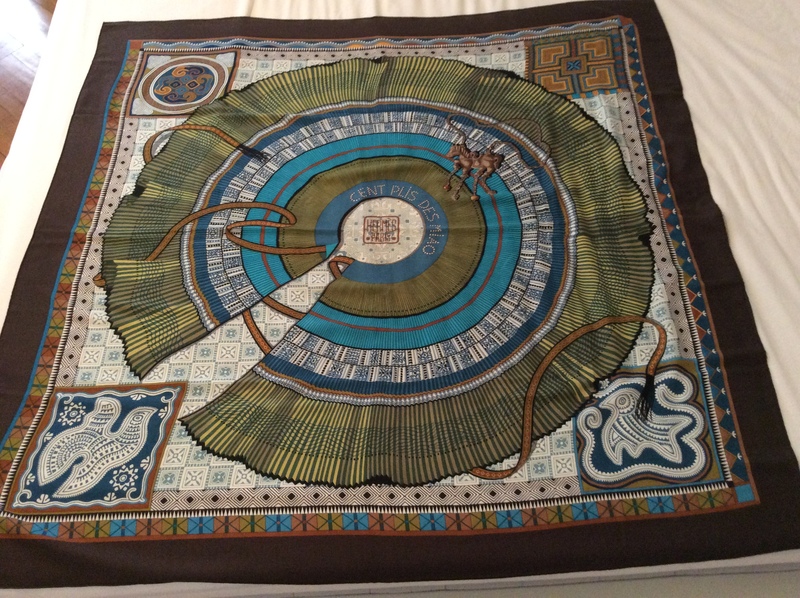 This entry was posted in Hermès, Scarf Collection, Scarves and tagged Cashmere, Hermes, scarf collection, scarves, Silk Scarf. Bookmark the permalink. 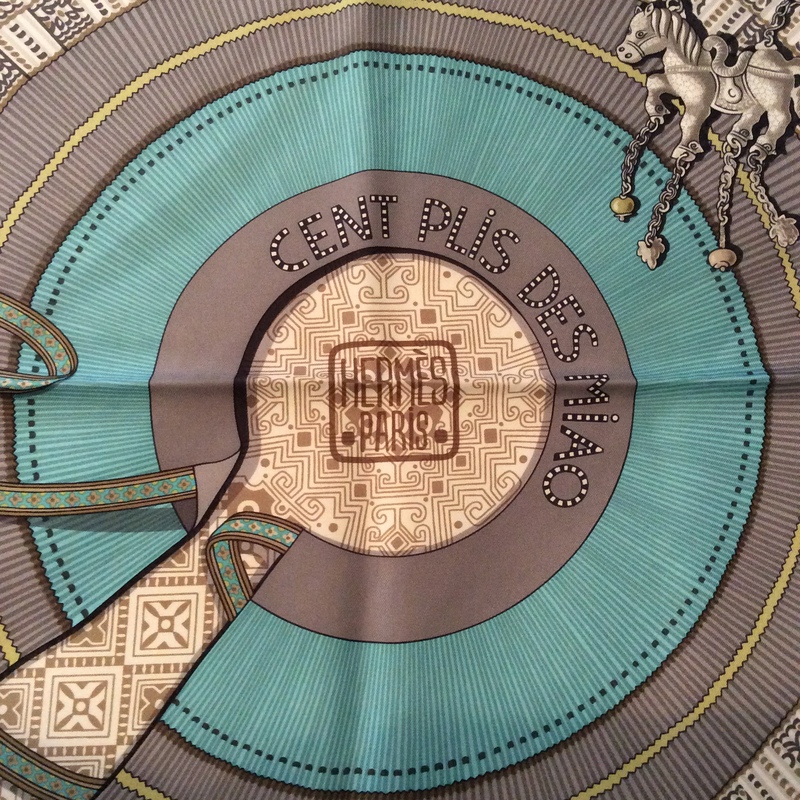 Your Hermes carre posts are even more intriguing to me than the perfume ones! Regards! So good of you to say that, thank you very much, Preska! 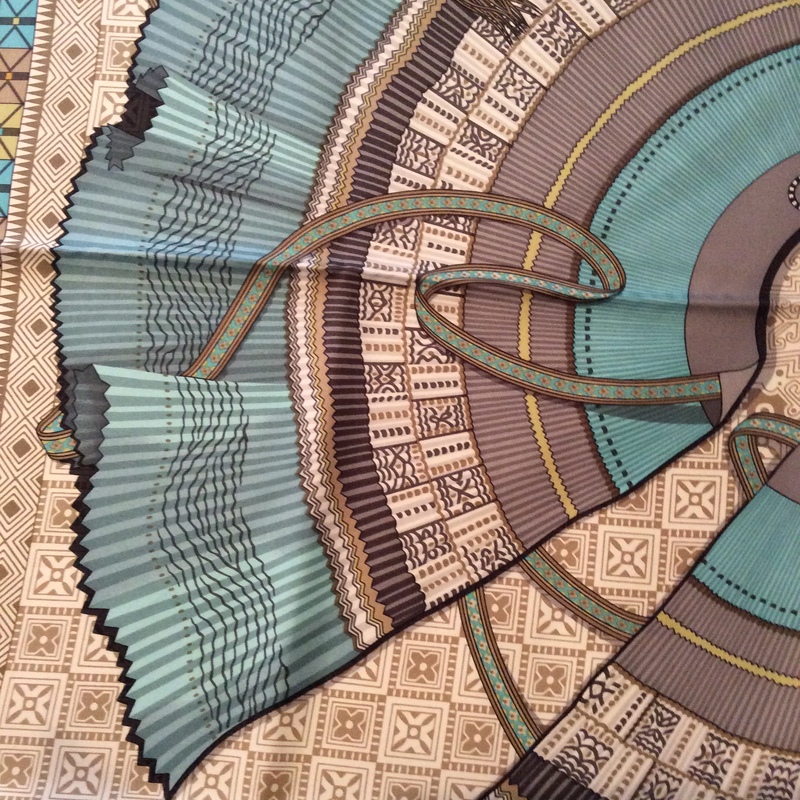 Oh my, this is a beautiful scarf, and it is so nice to hear the story behind it. Thank you so much for sharing that. I’m very interested in Asian culture and I think this scarf is just perfect. It has so many layers, it’s like a good book: it tells many stories at once. It makes me really happy to know that there is so much beauty in the world (but also a bit jealous😅). I know that I know way too little about Asian culture amd this is a great reminder to educate myself a little in that regard. Such a gorgeous scarf B! Thank you for sharing the story behind it. I think the stories bring the scarves to life. They do! Thanks for reading, Sandra! With every post I seem to have a new favourite but I could really see myself wearing that stunning CSGM. I can totally see you wearing that too! The colours would suit you so well. I do the same thing with new things. I won’t wear them right away because they’re so new and fabulous and I’ll just ruin them. I’m not sure why I do it but I always have. It drives my hubband nuts. He’s the opposite. If he gets something he is wearing or using it right away. Those are very pretty scarves. I love the dimensional effect in the design. I could use that cashmere one now. Contrary to what the calendar says, spring has not sprung here. A warm hug would be great. I wish I could send you a hug. The dimensional effect here is really amazing! Oh that must have been a great exhibition, it sounds fascinating. Glad you got a scarf to remind you of it. 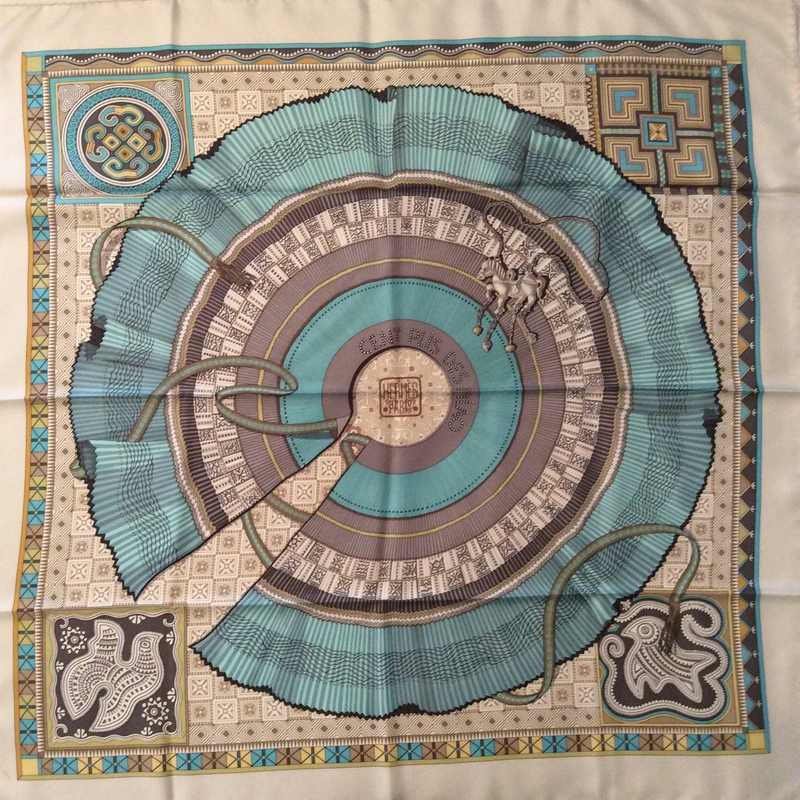 I have just one thing to say (but I also share the general phobia of ruining new things, especially very pretty ones, and such a Hermès scarf is a thing of beauty): you have exquisite tastes. Have an excellent w-e! P.S. I am wearing 24 Faubourg after a one week break and, from time to time, I smell ripe, sun-drenched apricots??? As for 24 Faubourg: I have not smelled it in depth for quite some time, but I say sun-ripened apricots is a wonderful discovery in this golden perfume! Enjoy! Yes, they make cashmere things too and they are wonderful. Happy weekend to you too, Johano! Excellent photos of superb details–such craftsmanship! Thank you. Thank you! The Hermès craftsmanship is unparalleled in my opinion. What a treat! I didn’t know that such exquisite items existed, and seeing them is such a pleasure. 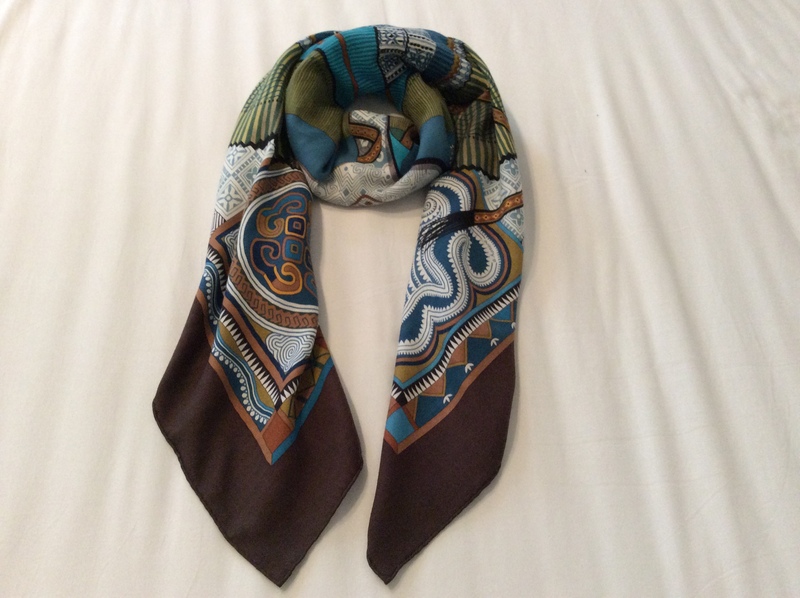 Thank you so much for sharing them..
Birgit, I love the way the large cashmere-silk scarf looks when it’s folded, with that combination of browns and blues, with a touch of olive green. I’m sure it does feel like a hug. I love your story about the silk version, too, and I have to say that if it does have your mark on it now, it’s not visible to my eye. It looks pristine to me! It was interesting to learn about the design, too. I wonder how long it takes to make one of those skirts?!! I wonder too… maybe I can find a documentary about the Miao, this post really stoked my curiosity. The cashmere scarf would suit you well, Suz! 🙂 Once you’ve gotten lipstick or lip gloss on your scarf it’s “ruined” forever and that makes it just so much more wearable – I know how it feels. But I enjoy these a lot more, because after their first mark they’re worry free. I’ve got a very colorful Cent Plis de Miao silk version of this scarf: pink and black – I loved the design from the very first time I’ve seen it! I love your pink-black scarf, it must suit your colouring so well! 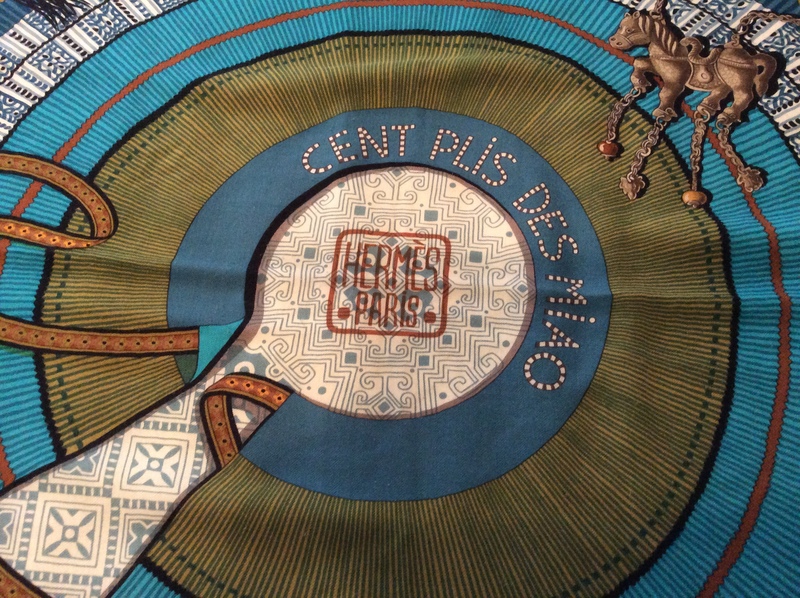 The Hermes Paris “seal” at the center of the Cent Plis design is very clever. It quietly comments on the east-west cultures and influences at play in this lively design. I think it is a gentle reminder that silk (from sericulture to silk-screen) are gifts from the Eastern world to the West. I love it! Great serie and beautiful, very wearable scarves. 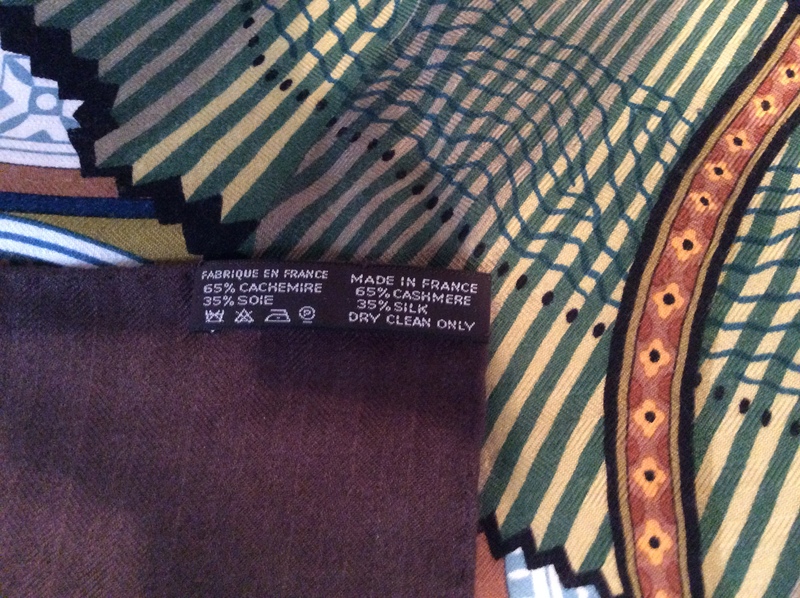 I’m also afraid to wear brand new Hermès scarves. I’m embarassed to confess two of them, after three years in their boxes, are still waiting for the premiere. Nowadays I therefore buy the Hermès 2nd hand and those (often vintage) are in frequent rotation, worn with no fear as usually there are some stains from their earlier lives. When it comes to the CSGM:s I hesitate to buy one as I read on Purseforum some members have problems with pilling. As I understand the problems where related to CS scarves of later years. Any experiences? The slightly lived-in scarves are so muc easier to wear, breaking them in is hard, I completely agree. Thankfully I’ve had no problems with my CSGM’s so far. My oldest is now in heavy rotation for five years and there is no pilling. Guilty of not using new stuff too Birgit. I like to look at it new for a while before I use it. Once I do it quickly becomes every day wear. The colours in the silk 90cm are so beautiful. The colours of the silk Cent Plis are so soft and truly pretty. Exquisite, even though CSGM sounds a bit like some kind of minority group or a food additive or trade union, maybe. Love the colours on both and I can completely relate to your problem about not using new things. This weekend I have broached a new sponge bag for the first time and I must’ve bought it five years ago?? !